Duncan Rouleau is a writer and artist who is possibly best known for his recent Metal Men series for DC or his run on X-Factor for Marvel or for being part of the Man of Action artist collective that created the Cartoon Network series Ben 10. 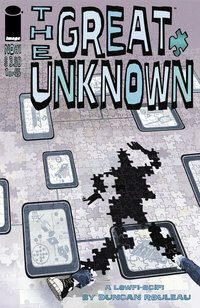 His new mini-series for Image Comics is The Great Unknown in which a guy named Zach Feld begins to think that someone is stealing his thoughts when he starts seeing the things he dreams up out in the real world. Is he crazy or is this really happening? It's a weird sci-fi drama that deals, at least metaphorically it seems, in intellectual property disputes. Here's an interview with Rouleau in which he claims this book is an autobiography about how he was the first to start using the word "NOT" at the end of sentences way before other people started using it. Some nice preview images too. 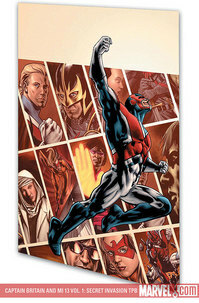 Captain Britain and MI:13 is a new Marvel series getting it's first traded collection this week. The series spawned from another Paul Cornell written book called Wisdom which received a lot of critical acclaim, most of which has followed along to this new book. It also launched itself with the help of Secret Invasion, the big Marvel crossover event in which Skrulls take over the Earth. This first volume deals heavily with the Earth's Skrull issue as a team of British superheroes is formed by the secret British intelligence agency, MI:13, to defend the Kingdom from the shape-shifting alien invaders. Captain Britain is one of those longtime Marvel characters who seems to have performance issues with his own series. It's always best to pair him up with other heroes like they've done in the past with the Excalibur books. Here he's joined by various UK-themed heroes like Union Jack and Black Knight as well as some British spy characters like Pete Wisdom and John The Skrull (a former member of the Skrull Beatles, it seems). Although I'm a devoted reader of Robert Kirkman's Walking Dead and am anxiously looking forward to attending this Friday's screening here in Charlotte of Night of the Living Dead (featuring a discussion with George Romero) I'm a bit over the whole zombie comic fad. However, this is an exception on par with Kirkman or Romero. 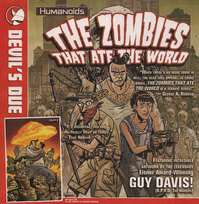 A European zombie book with art by Guy Davis! Davis' work can most recently be seen in the monster-ridden series B.P.R.D. where he's proven to be a master at both atmospheric creepiness and subtle comedy. Devil's Due Publishing has been attempting to bring translated reprints of the European Humanoids books to the US and this ongoing series originally started out in the popular sci-fi anthology Metal Hurlant. It's a comedy that takes place in the year 2064 when the zombie apocalypse has gotten past the point of no return so the government instates a policy that gives zombies the right to 'live' among the still living. Naoki Urasawa is a Japanese Mangaka creator who has been riding on a recent wave of popularity in the U.S. due to the recently concluded translations of his serial killer drama, Monster. 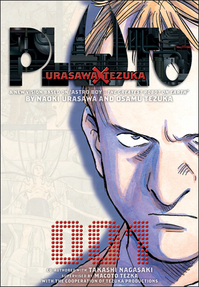 This week Viz Media begins reprinting two other Urasawa books that have been very popular in Japan. The first is Pluto, an 8 volume series inspired by Osamu Tezuka's Astro Boy. Urasawa picks up on some minor characters from that book's "The Greatest Robot on Earth" storyline and explores Tezuka's world in his own way. The story is a gritty murder mystery in which a robot detective named Gesicht investigates a string of robot and human deaths that may be the first murders committed in years by a robot. 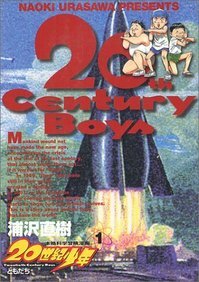 The second Urasawa book is 20th Century Boys, a book he originally published simultaneously with Monster and which runs to about 24 volumes. This one has gotten a bit more critical praise than Pluto and received many awards during it's original run. Inspired by the works of Stephen King (notably It - you'll recognize the similarity shortly) the story concerns a group of friends who find themselves connected through memories of their childhood to a string of mysterious disappearances and a sinister worldwide conspiracy. The sci-fi mystery plays out across four different eras ranging from the 1960s to the year 2014 and addresses themes of coming of age and growing into adulthood.